Social connections are important to most of us. We need people around us to share our lives with – the blossoming of online social network sites in the last decade is visible evidence of this. When people experience mental health difficulties they frequently also experience a shrinking in their networks. People ebb away due to the stigma of mental health difficulties and individuals’ own problems in maintaining their social connections. 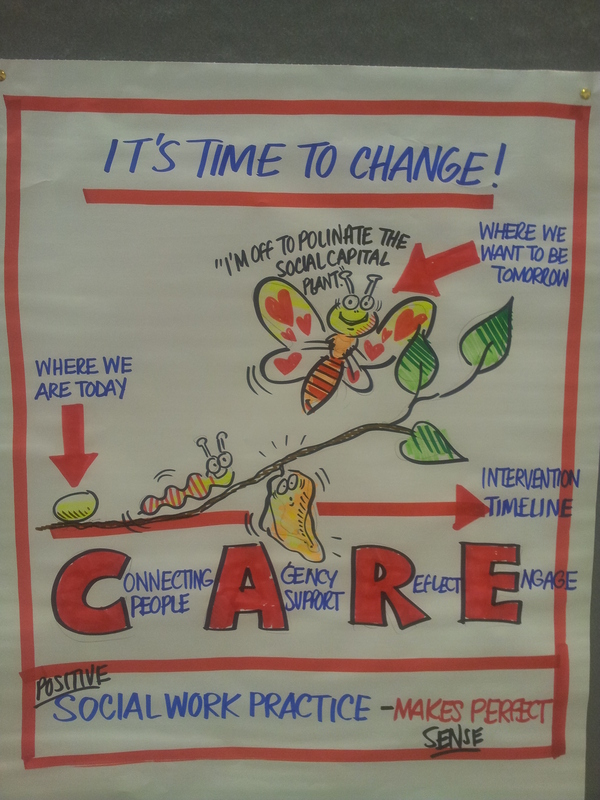 The Connecting People study has developed and is piloting an intervention model for mental health services to help people to enhance their social connections. It is funded by the NIHR School for Social Care Research. The Community Health Networks study has mapped the networks of people with severe mental illness to explore the importance of people, places and activities in supporting recovery and investigate the (potential) role of primary care and secondary mental health services in community network maintenance and development. It is funded by the NIHR Health Services and Delivery Research programme. Connected Communities is an action research programme that explores social network approaches to social and economic challenges and opportunities. It focuses on understanding, mapping and mobilising networks of support and co-producing action with local communities in a way that takes into account what is already there. 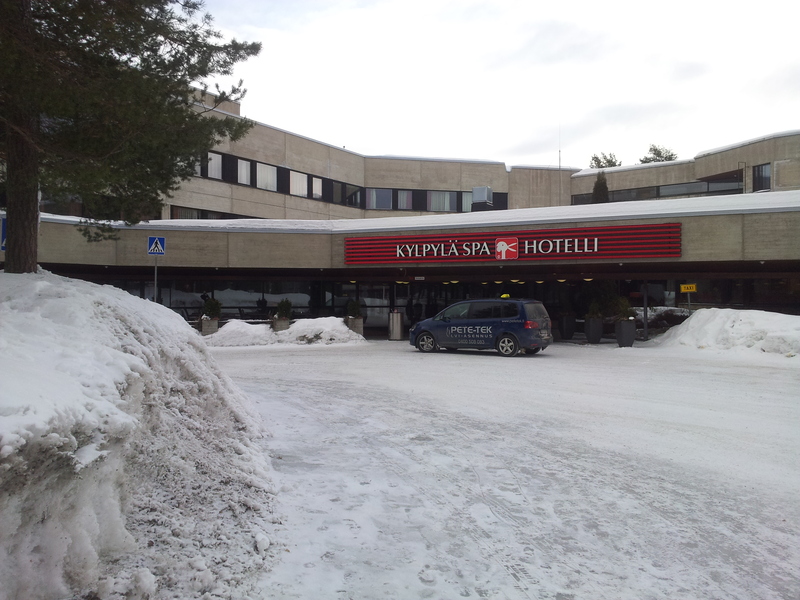 It is funded by the Big Lottery. 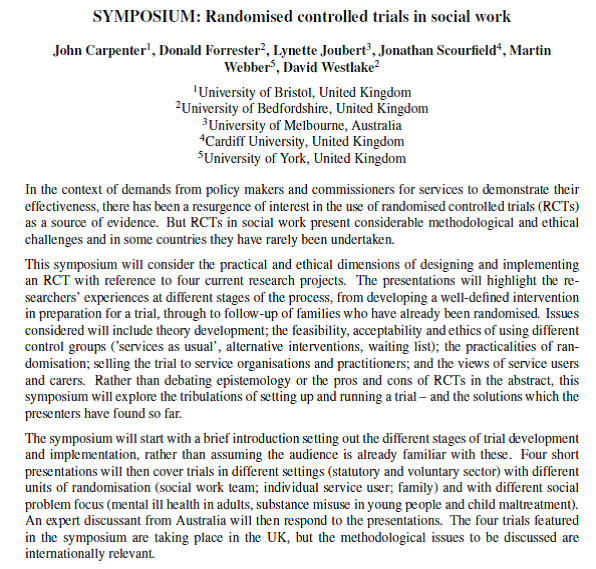 The seminar will provide practitioners with an opportunity to engage with the emerging findings of these studies and to reflect on what they mean for social work and social care practice with people with mental health problems. 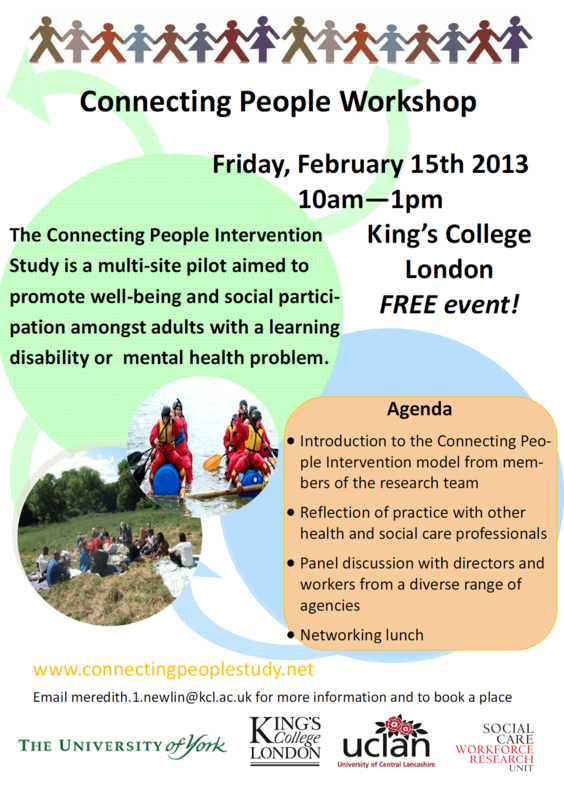 A final plenary session will be chaired by Dr Ruth Allen, Director of Social Work at South West London and St George’s Mental Health NHS Trust and Chair of the Faculty of Mental Health at the College of Social Work, which will explore the implications of these studies for mental health practice. Practitioners will take away intervention models they can use in their practice to help individuals engage with their networks or communities. They will have an enhanced understanding about the role of communities and networks in an individual’s life and how they can assist recovery. Community and asset-mapping techniques will be discussed to provide practitioners with tools they can use in their practice. For more information and details about how to book a place, please visit the Making Research Count website. The NIHR School for Social Care Research has funded the creation of short films to accompany training materials for the Connecting People Intervention. The films have been created by Trafford Community TV, a social enterprise spun-off from the Trafford well-being centre blueSCI who are participating in the Connecting People Study. The films have been developed to assist training sessions about the Connecting People Intervention model. They feature practitioners talking about aspects of their practice within the context of the model. The different opinions expressed by them are certain to provoke discussion in training sessions when workers explore what they think about the practice involved in supporting people to develop or maintain their social connections. All the films can be viewed via the menus on this website. An introduction to the films can be found by clicking ‘training‘ in the menu above. Question 1. How should I view the person that I am working with? Question 2. How can I manage boundaries with an individual? Question 3.How can I keep building on my own community knowledge? Question 4. How do I overcome barriers faced by working in this way? Question 5. How do I identify in what areas I can best help an individual? Question 6. How can I get someone to try something new? Question 7. How can I help someone to move on? Question 8. How can I link an individual to someone new? Question 9. How can I help the individual to overcome barriers? Question 10. What kind of environment works best? Question 11. How does this fit with our existing practice? Question 12. How can our agency form better links with our community? Each page has a short film and a PDF document with some suggested exercises for use in the training session. They can be used in sequence or dipped in to as required. We are keen to hear what you think about the films. Please leave us a comment to let us know what you think about them. 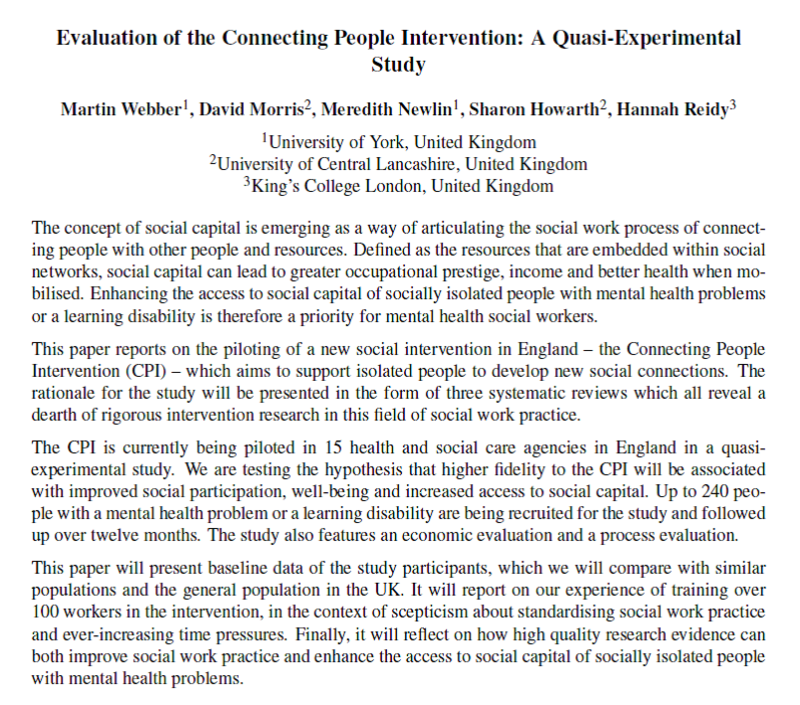 Earlier this year the Connecting People study team successfully obtained an additional grant from the NIHR School for Social Care Research (who are funding the study) to produce training materials and short films about the Connecting People intervention model. The films and training package will be made available on the this website in the early autumn for anyone to use. In the course of the filming, we have captured the perspectives of practitioners and service users about how the Connecting People intervention process works and what its outcomes are. We are finding out more about this in the study itself, but the films vividly capture individuals’ experiences of the impact of the model on their work and lives. The first of these films will be uploaded shortly to YouTube as a taster of what’s to come. 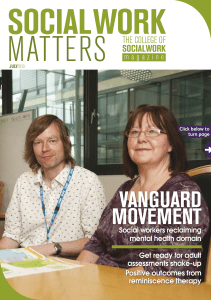 Anticipating the release of these film clips, The College of Social Work interviewed Rob Goemans (Professional Social Work Lead) and Jackie Stallard (Mental Health Social Worker) for the July edition of their online magazine Social Work Matters. Rob and Jackie both work for the Lincolnshire Partnership NHS Foundation Trust where they are piloting the Connecting People intervention model. Rob described Connecting People as “more than just an intervention. It’s an overall framework of how social workers, other professionals and services work with people with mental health needs”. 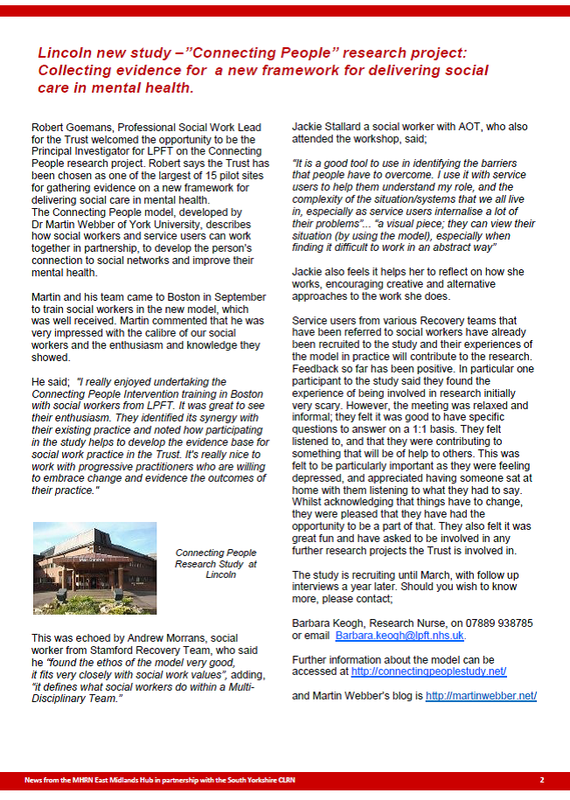 He went on to speak about his hopes for the model in providing an overarching framework for mental health social work backed up by research evidence. Jackie spoke about how the model provides hope to mental health social workers who, in many places, have become disillusioned by mental health trusts obsessed with targets and squeezing out social perspectives. “My priority is the person I’m working with and helping them achieve the best quality of life they can,” she said. The full article and clips from the interview can be viewed online in Social Work Matters (flash is required). Alternatively, a PDF version of the magazine can be downloaded here. 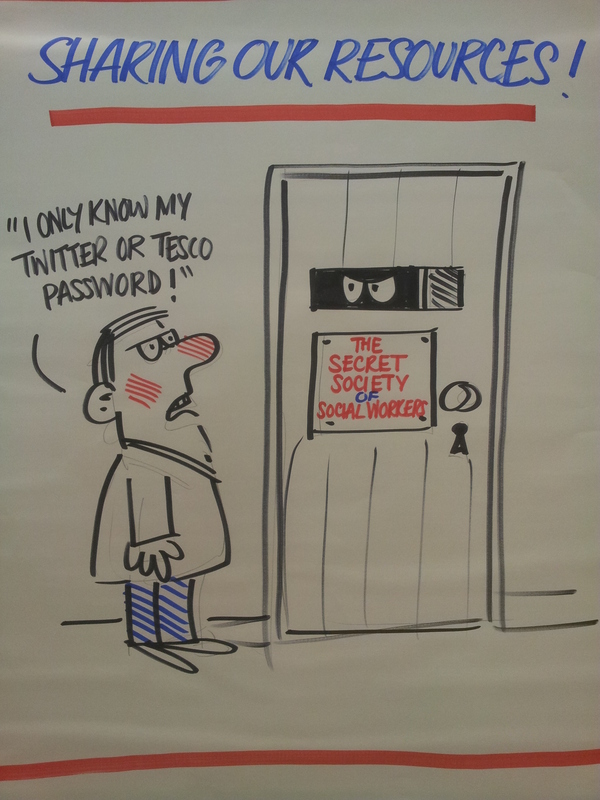 Social Work Matters is a magazine for members of The College of Social Work, but is reproduced here with the kind permission of its editor, Mark Ivory. 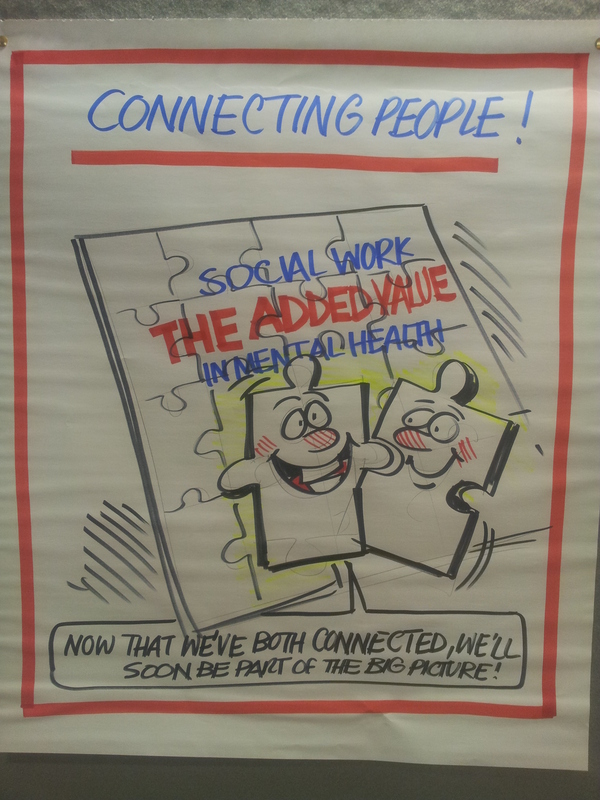 Today I presented some information about the Connecting People Intervention model to a conference of mental health social workers in Hertfordshire Partnership University Foundation NHS Trust. There was considerable interest in the model, though the practitioners were aware of the institutional barriers they are facing which make it unlikely that it can be implement there just yet. Please let us know what you think about them. If you have a cartoon or experience about the Connecting People study to share, please drop us a line. Thank you!